Jean Cosset, the son of Jacques and of Renee Mascouine (or Macouin), was born in 1645 (or 1642 or 1634) in Saint-Etienne-des-Loges (now Saint-Hilaire-des-Loges), diocese of Maillezais in Poitou, France. He was 23 or 24 years old when he came to New France (Canada). His presence is first noted in the general census of 1667 as a servant in the home of Bertrand Chesnay de la Garenne, of the Beaupre coast where he tended to14 animals and 24 arpents of cultivated land. Pierre Cosset born 1678 died after 1698 and before 1710. The 1681 census places the family in the Seigneurie of Ecureuils. The head of the family was then 36 years old and his wife was 30, the children mentioned were Jean and Marie, and the list of property included 2 guns, 2 cows, and 6 arpents under cultivation. It was at the farm at Ecureuils where death struck Jean Cosset. He was buried at Neuville on November 13, 1687. In less than a two month interval Jean and two of his sons departed this life. Rene Cosset was barely a year old at this time. On December 21, 1687, Msgr. Cyprien Tanguay wrote the following: “The number of annual deaths, which had never exceeded 170 since the establishment of New France, reached 471 as a result of victims massacred by the Iroquois,” In the parish of Pointe-aux-Trembles, in Quebec, the records for 1687 also indicate an increase in deaths, but the abbot Jean Basset, who was curate there for more than 30 years, nowhere indicates any particular reason for this fact. Were the deaths attributable to an epidemic? We do not know but smallpox was a possibility. Jean Collet turned up at Pointe-aux-Trembles in 1688 and proposed marriage to the widow Marguerite Cosset. The wedding took place on October 19, 1688, and from this union were born three daughters: Marie, Marie-Isabelle, and Marie-Catherine. Marie and Marie-Isabelle died young. On 19 Aug 1698, Jean Collet acknowledged that Marguerite Eloy Cosset had brought to their joint property the sum of 180 Livres as well as some furniture belonging to Jean Cosset. On the same day they made each other mutual and reciprocal heirs of all their assets. Jean Collet was buried at Batiscan, on September 12, 1699. During the next several years, the widow continued to take care of the land that her first husband had owned at Pointe-aux-Ecureuils. Marguerite Eloy died on March 30, 1728 at Sainte-Genevieve-de-Batiscan. SOURCE: King’s Daughters and Founding Mothers: The Filles du Roi,, 1663-1673 by Peter J. Gagne – Volume 1. THANKS to the Cossette Family Association and in particular to Guy Cossette. 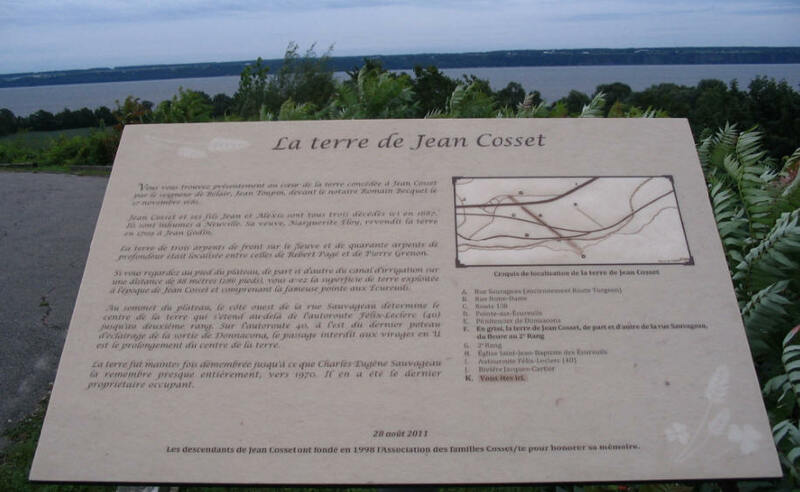 In 2011 The Cossette Family Association placed a plaque on the property once owned and farmed by Jean Cossit. Copyright © 2013 & 2014 Cossitt Family Association Inc. All Rights Reserved.